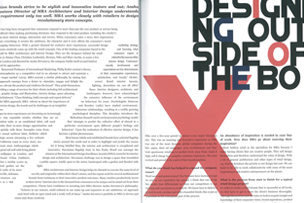 Anshu was interviewed for Third Floor 4th Edition - a publication by the School of Design at Southampton Solent University. Third Floor is an insightful, visually enticing publication for creative professionals, offering an informative and intelligent perspective of the fashion industry. You have carved out a real name for yourself, how did MRA start? 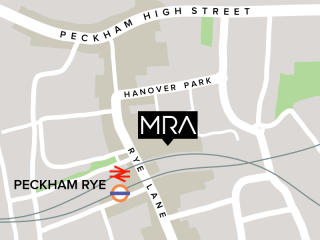 MRA was established as an architectural practice in 1996 and got its first retail break soon thereafter when we were appointed by NIKE to design and implement stores throughout Europe. We completed over 40 stores for NIKE over a five year period in almost every major European city. This was an amazing and formative experience as NIKE was one of the most dynamic global companies during the late nineties, their ad campaigns were revolutionary and they took sportswear retailing to another level, away from ‘stack it high, sell it cheap’ to a complete customer experience. We were excited and proud to be a part of that transformation. What do you think has helped to expand the company name? Hard work and perseverance! Our fortunes have increased year on year as our reputation has spread mostly by word of mouth. I think that one of the key points that differentiate us from our competitors is our training and experience as architects. We know how to deliver a project to cost, on time and with a beautiful finish; this is just as important as the conceptual part of the process. An abundance of inspiration is needed in your line of work, how does MRA go about sourcing their inspiration? I chose fashion retail as the specialism for MRA because I enjoy having clients that are creative people. They sell design themselves and therefore understand the value of design. With a lot of general architecture and other types of retail design, e.g. food or furniture the priority is not design but cost. We are lucky to be able to work collaboratively with some of the most inspirational and creative entrepreneurs on the planet. What does MRA feel is important when designing retail interiors? Well this is a very short question, but the answer could stretch to an entire volume. Whilst clients vary in their product offer and price point, we always aim to design environments that effectively communicate the brand’s values and assist the customer to enjoy their visit to a store and feel good about their purchase. What is the process from start to finish for a typical retail design project? In order to create a retail format that is successful at all levels, we first have to thoroughly get to know the client’s business. Through discussions and site visits we look to acquire insight and knowledge of their corporate vision, brand aspirations, product offer and if appropriate their existing retail presentation. Our design process is underwritten at all stages by the need to address cost, programme and operational requirements and we assist the client to create a clear brief in this regard. Whether applied to a standalone or concession the concept should allow the customer to immediately recognise the brand from a distance and enter the store with a sense of anticipation. The visual merchandising, graphics, material choices, furniture styles, lighting moods and incidental decorations should all communicate the brand’s story and reflect the personality of the product. The entire narrative has to be consistent. An integrated vision. How do you find the balance between functionality and being aesthetically pleasing? Functionality, durability and flexibility are not mutually exclusive with beauty. We try at each level to insist on using authentic materials and on crafting the details. However, it is only through actually using a store over time that all the practical issues become clear. So it is vital that we build a long term relationship with the client and feed this field knowledge back into the design development. Is there a clear difference in the interior design briefs set by high street fashion retailers and luxury fashion retailers? The fundamentals are the same, but the focus is different. Luxury brand is far more concerned with showcasing the product, whilst high street clients are more interested to create an environment. What developments have you witnessed for unique in-store experiences during MRA’s lifetime? Well I spoke earlier about our experience with NIKE and shortly after we worked as executive architects for Mango. Along with Zara, Mango rewrote the rules in terms of high street fashion retailing. The sophistication and quality of the collections and the store interiors entirely belied the price point of the actual products on offer. It was a massively aspirational design approach, across the board and changed the retail landscape over the past decade. What innovative and original interior design concepts have been your favourite to evolve? Well our latest concept for Agent Provocateur is possibly one of my favourite. We have just opened new concept flagship stores on Madison Avenue in New York and Rodeo Drive in Beverly Hills and it has been a wonderful experience. As you know Agent Provocateur is a quintessentially English brand. Their early success has been built on a quirky approach which has its tongue firmly in its cheek. As the company has grown on an international scale, they have come to us to develop a new concept that retains all of the humour and sexiness of the brand, but makes it more glamorous and elegant. It is important for the brand to have an interior concept that works cross culturally, as well in London as in New York, Dubai or Seoul. Your ongoing projects with certain retailers reveal the quality of your work and service, which clients have you completed the most work for? What do you think has helped build a strong relationship with them? The talent, skill and dedication of my colleagues are the key ingredients in our success, both in capturing and retaining clients in what is a very competitive marketplace. We have a number of long standing clients, but Jimmy Choo stands out as a key partner. We have now completed over 60 projects with them in the last three years, that’s almost one boutique opening somewhere in the world every two weeks! Fashion retail can often be quite structureless and is always in a rush. Therefore, our clients appreciate our methodical approach to get things done. We are rational and direct with them; rather than inhibit creativity I believe working in this way makes the space for real creativity to flourish, it also helps deliver the projects on time and cost and these are critical elements for winning trust and therefore repeat business. The increasing desire and trend to apply 4D features within stores are a growing demand, is this something MRA is interested in or is already doing? If so, how? Instore IT communication and web integration is a very important part of the story for some retailers right now and we are certainly beginning to feature this type of technology more and more in our projects. I think however, that whilst we will see greater use of these technologies in most retail formats, it will be less so in fashion retail as the experience of actually touching and trying on the garment, shoe or accessory is still paramount. What has been the project MRA is most proud of? That’s like asking which of your children is your favourite! We have been very fortunate to work on some amazing projects, but I was particularly happy when in 2009 we opened the flagship Zilli store at the base of the Four Seasons Hotel in Manhattan. This was our first luxury brand client who gave us a carte blanche on design and we had great fun developing the concept and implementing it in possibly my favourite city. What has been your most challenging project? Again, a very difficult question, but the most difficult projects are often those where we act as executive architect, bringing to life a concept devised by another designer, who is often quite remote from the implementation process. We have to be the design guardians making sure that the concept is not compromised as we traverse the protocols of city planning, building control and landlord’s consent etc. In this regard working on the Jean Paul Gaultier store with Philippe Starck was quite a challenge as the entire store was white, including polished plaster walls and the resin floor. The flagship Mango store on Oxford Street at 4000m2 was just enormous, with very complex structural steel and glass elements. We have just opened an incredible store for Tiffany & Co at Canary Wharf and the number and complexity of specialist materials was mind boggling. Could you describe a typical day in the office for yourself? I don’t have a typical day. As the company has grown, I am more involved in developing new business and international marketing. We actually run three companies within the MRA group which respectively look after design, construction and our work in France. I travel quite frequently, and so much of my work is done whist on route to somewhere. When I am in the office, I touch base with my colleagues on all levels of the business. I am very lucky to have a wonderful creative and technically expert team of colleagues who run the projects on a day to day basis. Do clients tend to have a specific design idea in their head or is the concept completely left to MRA? It varies depending on the client and the point in their ‘company story’ when they approach us. We often inherit a specific concept that we then develop and at other times we are fortunate to have a clean slate to start with. Are there any emerging trends you see for retail design in the future? As many couture designers are collaborating with high street brands, such as Jill Sander with Uniqlo and Lanvin for H&M, I expect to see high concept architects and artists begin working with high street brands in the near future. Whereas Rem Koolhaas and Renzo Piano were happy to work with Prada and Hermès in the past decade, I expect to see current and emerging ‘star architects’ working with global fashion brands. Iconic large format statement stores will become important for fashion brands, just as they have already for Apple and NIKE, not for shifting product per se, but to create excitement and raise profile. What are your current projects? We are very busy with almost 20 new boutiques worldwide for Jimmy Choo and Agent Provocateur. We have a number of business opportunities in India that we are developing and we expect to be working on a major luxury brand flagship store in London later this year, but for the moment it is under wraps! What does the future hold for MRA? We are growing our construction division, where we offer our clients a seamless turnkey solution including design, project management and construction, this part of the company has already built projects for Jimmy Choo, Esprit and Vanessa Bruno. We are a relatively small company, but we have a great portfolio of blue chip clients past and present. Our work is now firmly established on four continents and our reputation is continuing to strengthen.